My four year old has been looking forward to seeing Corduroy by the Emerald City Theatre Company since I told him about the show in December. So expectations were high as we walked into the noisy Athenaeum Theatre. It was the perfect space for a children’s show- the look of a big, Broadway theater but scaled down to be child sized. We talked about the stage, the curtain, the boxes and the balcony as we waited for the production to begin. For a new and little theatergoer, this is a great place to start the journey! As the show began, it struck me that this type of theatrical production is one of the privileges of living in a theater hub. Chicago is a place that attracts all kinds of performers and talent from around the world and it is hard to imagine Corduroy being produced without the trained circus performers in the cast. Jean Claudio, who played Corduroy, is from Puerto Rico via Argentina and was fantastic. The only word he utters in the show is “button,” but through movement and expression, we felt connected to poor little (or in this case, big) Corduroy as he searches the department store for his lost button. 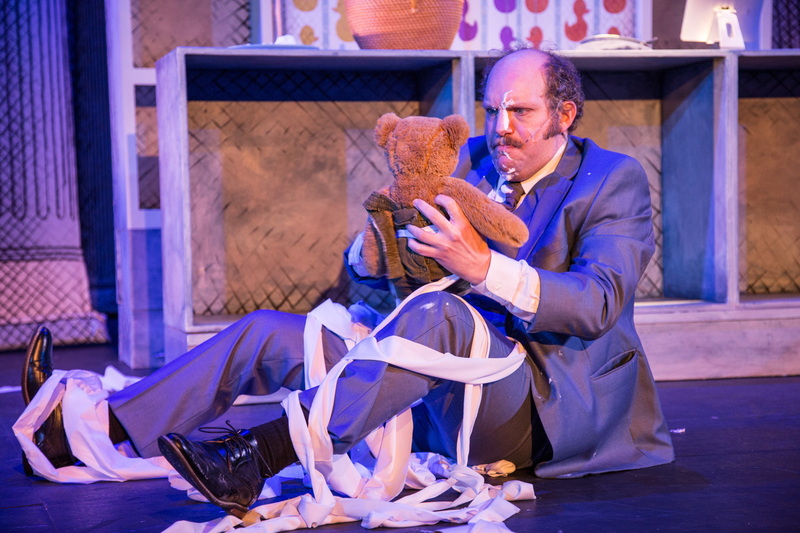 Using his circus and mime skills, Corduroy has the young audience both fully engrossed and fully laughing as he flips, falls, gets himself stuck in buckets, and travels up and down escalators. The moments with Corduroy onstage as well as his partners in mess making, two clowns played by Averis I. Anderson and Kelsey Shipley are fantastic, entertaining the children and adults alike. In fact, this was the youngest audience of any show I’ve ever attended and also the nosiest. Yet when Corduroy was on stage, the noises of restless children quieted down as we all enjoyed Corduroy’s antics. Technically, the show was perfect for the young audience. The whimsical look of the background of the department store and the set pieces filling in the different departments mirrored the illustrations of the book which help the young fans feel a part of Corduroy’s world. Not only were we impressed with Jean Claudio’s performance as Corduroy, my son and I both enjoyed the “magic” of how whenever a human discovered Corduroy in the store, he had magically transformed into a small stuffed bear- which I might add were being sold in the lobby after the show and I must admit, came home with us. My son thought this was so amazing that Corduroy could switch between real and pretend without anyone- at least in his mind- even noticing. Tech crew and actors seamlessly moved the set from store to Lisa’s apartment and the sound effects were just the right noise level for my son who was nervous about the potential of loud noises. Just for the joy of seeing Corduroy’s circus antics, I recommend this show for children (ages 3-6) and their grown-ups. But anyone who enjoys the original book as I always have will enjoy seeing Corduroy live on stage. The Emerald City Theatre Company’s Corduroy is now playing at the Athenaeum Theatre , 2936 N. Southport Ave., Chicago, through April 20. Performance times vary; check the website at Emerald City Theatre Company . Find more information about current play on our Current shows page and attheatreinchicago.com. ⟵Despite a solid effort by its ensemble, “Lured” is cursed by a weak script.